A team of financial mentors slammed Carlos Celdran, a known Duterte critic, and said "tourist guides shouldn't be financial analysts." "The Philippine Stock Market is crashing simply because the rest of the world knows that a drug war is a bad investment. Much less one that is run by Rodrigo Dutere and Bato Dela Rosa." The remarks of Celdran, who apparently is notorious of posting and sharing mostly black propaganda against the present administration, garnered a few hundreds of likes, reactions, and shares on Facebook. "Financial Education is badly needed nowadays. Tourist guides shouldn't be Financial Analysts. A lot of factors affect the movement of Stock Prices, not just Political Factors. Foreign Selling is evident now but this correction is expected. Never use your Influence to create Panic as it does nothing good. Dont be misinformed. Go get a Financial Mentor. If you dont have one, PM us thru this page and we have Financial Mentors ready to guide you. 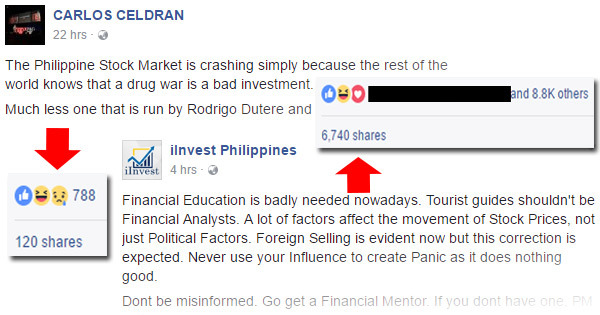 The group attached a screenshot of Celdran's post and a comment from a financial advisor from COL Financial - Philippines. iInvest Philippines' statement, which was a brilliant idea as it turned into a free advertising opportunity, already got more than 6,000 likes and over 5,000 shares as of 3:30 p.m. today. If you base it on the figures, the statement netizens have favored is quiet obvious.